In this post, we will build a streaming pipeline to analyze the impact of weather conditions on New York City taxi trips. For this, we will create the pipeline shown in Image 1. 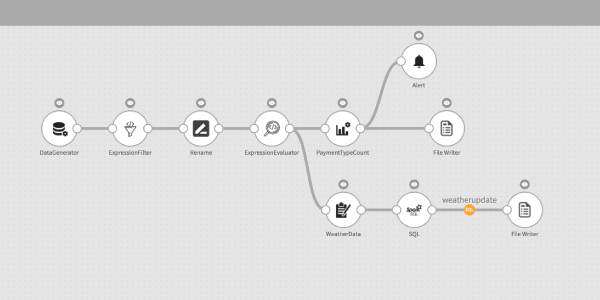 This pipeline can be accessed and run on StreamAnalytix Lite, a free to download and use single node version of StreamAnalytix enterprise edition. We will analyze two aspects; impact of weather conditions on the taxi trip (time taken to pick-up and drop-off the rider in co-relation to distance traveled), and the mode used to make payments (cash or card) to create alerts for cash payments beyond a set threshold. Read data from Data Generator, a streaming data source. Once you drag and drop Data Generator onto the canvas, right-click the operator to configure it. 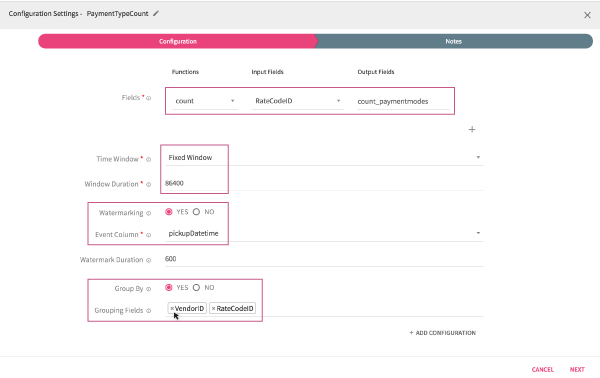 The configuration window will appear (Image 2). 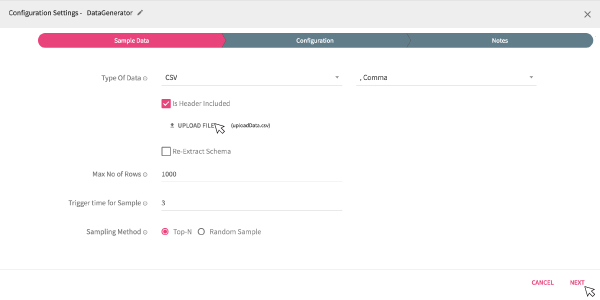 A schema identification window will appear (Image 3) driven from the auto-schema detect feature built-in StreamAnalytix platform. Click Next to save this schema. Schema derived from the auto-detection feature of StreamAnalytix can be edited to desired data type. As you save the data schema, the data inspect window will appear below the pipeline canvas (Image 4). Use Inspect Display window to apply pre-processing transformations to the data and alter it as required. Join the data with rest of the pipeline using Spark SQL (StreamAnalytix allows you to write your SQL queries in-line in the operator to join data set). Persist the data using a File Writer. 4. Right click on the ‘Spark SQL’ operator, a configuration window will appear (Image 6). Here you will see the ‘Weather Conditions Data’ is joined with the ‘Date’ of each taxi trip. The inspect display window will appear (Image 7) displaying weather conditions data (like min and max temperature, precipitation, wind, snow and more) corresponding to each taxi trip. To count the number of total payments made by card and cash, apply aggregator processor ‘Payment Type by Count’. Right-click Payment Type by Count. The configuration window will appear (Image 9). 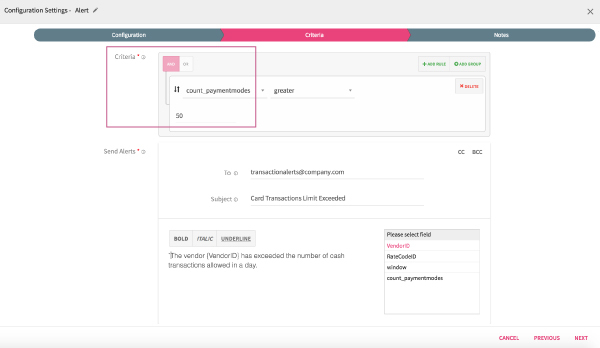 Drag-and-drop the Alert processor to create an alert for cash payments exceeding certain number. Right-click Alert. The configuration window will appear (Image 11). Input the desired number in the Criteria, exceeding which an alert for cash payments should be created. Use File Writer (Image 12) to persist the data. 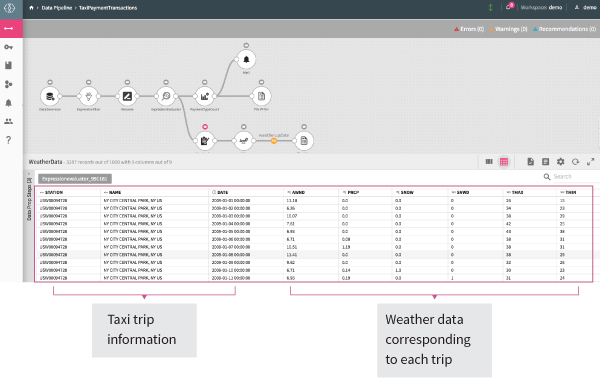 In this post, we will build a streaming pipeline to analyze the impact of weather conditions on New York City taxi trips. For this, we will create the pipeline shown in Image 1. This pipeline can be accessed and run on StreamAnalytix Lite (you can download the free to use StreamAnalytix Lite on your desktop here). We will analyze two aspects; impact of weather conditions on the taxi trip (time taken to pick-up and drop-off the rider in co-relation to distance travelled), and the mode used to make payments (cash or card) to create alerts for cash payments beyond a set threshold.